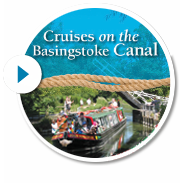 Chris Scott has had a long connection with Fleet and the Basingstoke Canal. His parents moved to the town when he was 12 years old, and he eventually bought his own house there. Last year, he decided that he would walk the entire length of the Canal, and did so starting from New Haw lock on the Wey Navigation (right). This is his interesting account of that walk, which took place over 4 days this August. Thanks to Chris for taking the time to write positively about the Basingstoke. Click here to read Chris’ account.